Check mermaid gifts off her Christmas list with this Mermaidens Gift Set in Asian Magenta! 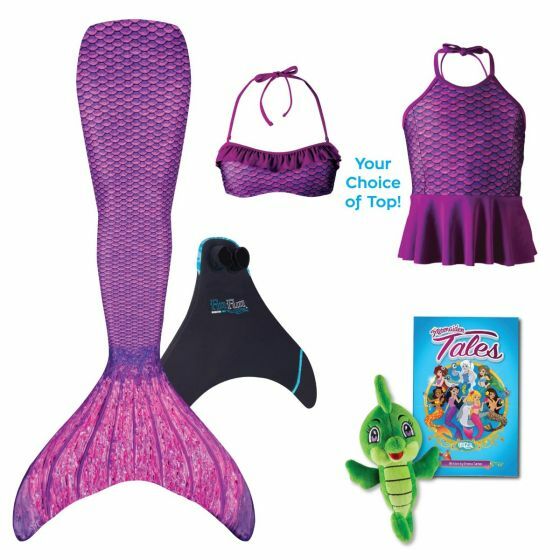 This mermaid tail and swim top set even comes with a few fun extras to make her smile! Create holiday magic with our mermaid tail gift set in youth sizes 6-12, featuring your child’s favorite Mermaiden Jia! She’ll receive our signature scale tail of purple hues, swim monofin, and swim top—plus get to know the royal princess better by reading the mermaid adventures found in our Mermaiden Tales book! And because reading buddies make story time extra special, she’ll also discover Jia’s FinFriend, Akiko the Seahorse, included as an added bonus in this exclusive gift set!